Sevil Baltalı Tırpan received her M.A in Near Eastern Archaeology from the University of Chicago and PhD in Anthropology from the University of Virginia. 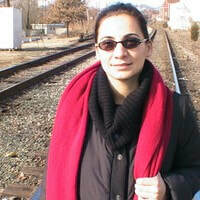 She is now an assistant professor in the Department of Humanities and Social Sciences at Istanbul Technical University. She worked on the topics of cultural contact and change; social differentiation; symbolism and architecture including houses and religious/ritual spaces of the ancient Near East. Trained both in archaeology and cultural anthropology her areas of most recent research explores the topics of politics of the past, heritage and culture, local perceptions of the past, impact of archaeological praxis on local people, ethnography of archaeology, space/place, landscape, memory, materiality and time. She is the associate director of the Kerkenes Archaeology and Ethnography Project since 2015. She has been conducting traditional and digital ethnographic field work on the local perceptions and representations of the past, archaeology, heritage and place in central Turkey.